Ashish Paul helps couple’s on their journey of parenthood by improving their fertility with ancient Ayurvedic Medicine and Western Herbal Medicine. 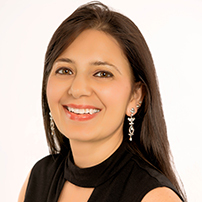 She utilizes meditation, yoga and her NLP/hypnosis skills to achieve the desired outcome for her patients. These therapies work with the natural rhythm of the body, treat the cause of a problem and have less adverse effects. Her aim is to bring awareness to the holistic benefits of Ayurveda and the western herbal medicine. She passionately speaks about protecting women’s health before and after having children. She educates people about the preventative methods to reduce the risk of diseases and live an optimally healthy life. Ashish Paul is a qualified Ayurvedic Physician (BAMS- Bachelor of Ayurvedic Medicine and Surgery) and a Medical Herbalist (MSc Herbal Medicine). She teaches yoga and breathing techniques to all her patients.